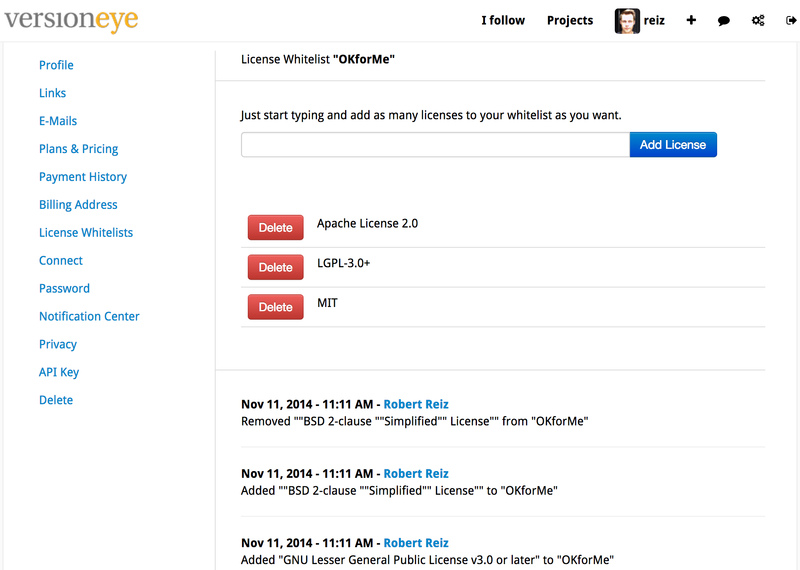 On VersionEye you can define a License Whitelist to enforce a license policy in your projects. Software developers are pulling in open source libraries every day, without carrying about licenses. They care about features. VersionEye can double check all open source dependencies against a license whitelist and send out notification emails if an open source dependency violates the license whitelist. This feature is very popular at VersionEye. One of the most asked feature requests to the license whitelist is an audit log. And here it is! Every time somebody adds or removes a license from a license whitelist it will be logged into the database. The audit log is directly at the footer of each license whitelist and it shows who removed/added which license at which time. The list is sorted descending by “created_at” date. In that way everything is reproducible.